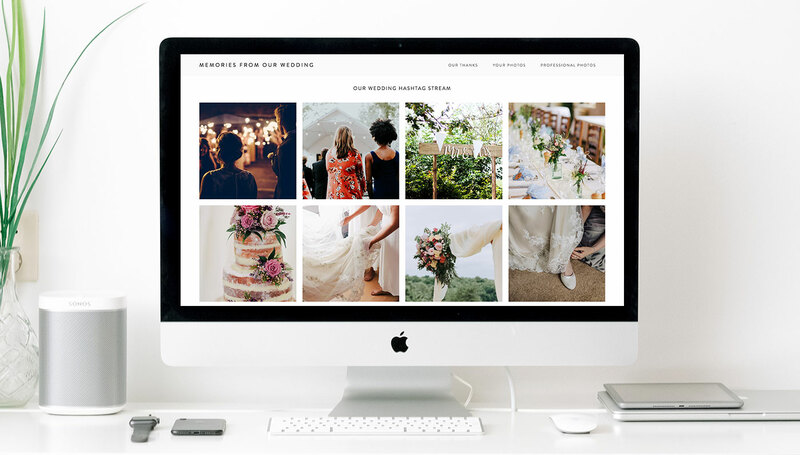 If you haven’t built a wedding website yet, what are you waiting for? 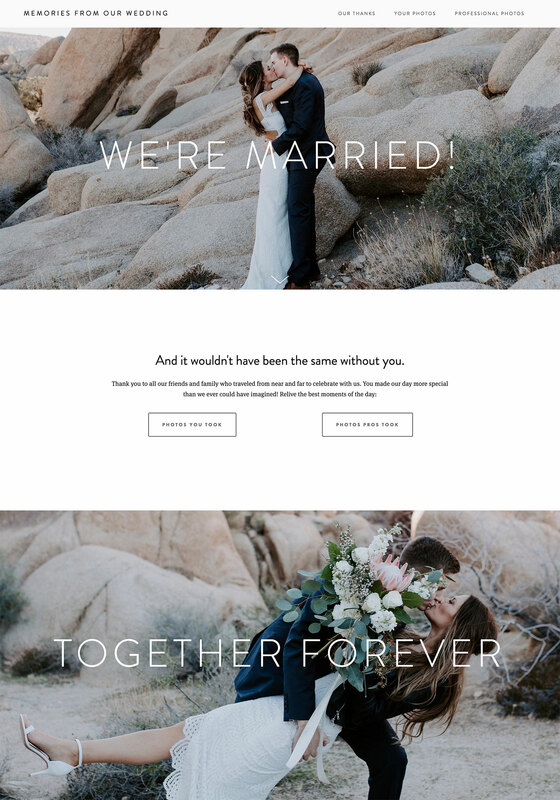 There’s no one in the game better than Squarespace when it comes to designing an all-in-one, beautiful space for your love story to live on the internet. Grab a domain name, pick a customizable template, and watch those RSVPs roll on in! You with us? Great! It’s pretty standard to create a wedding website these days, so we’re sure you understand the huge benefits. 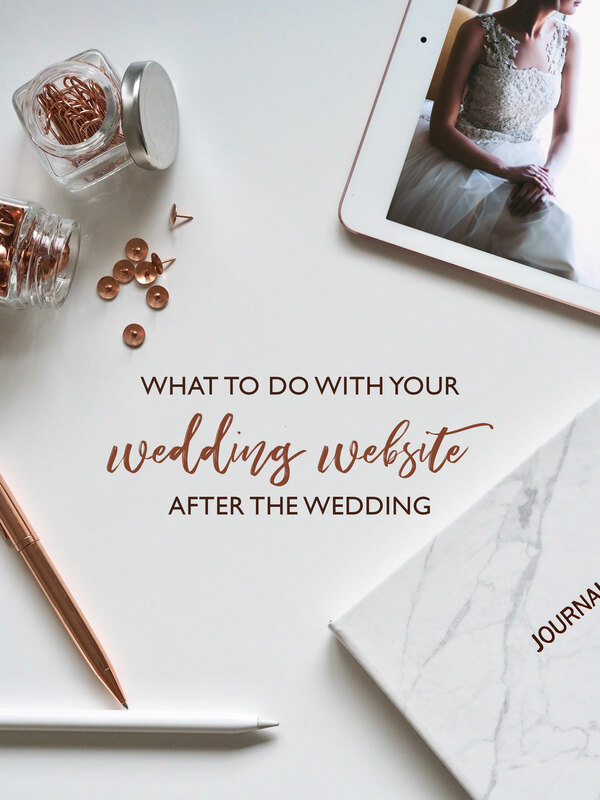 BUT—have you thought about what happens to your website after the wedding is over? Guess what…we have! And it has everything to do with memories. A digital keepsake, if you will. 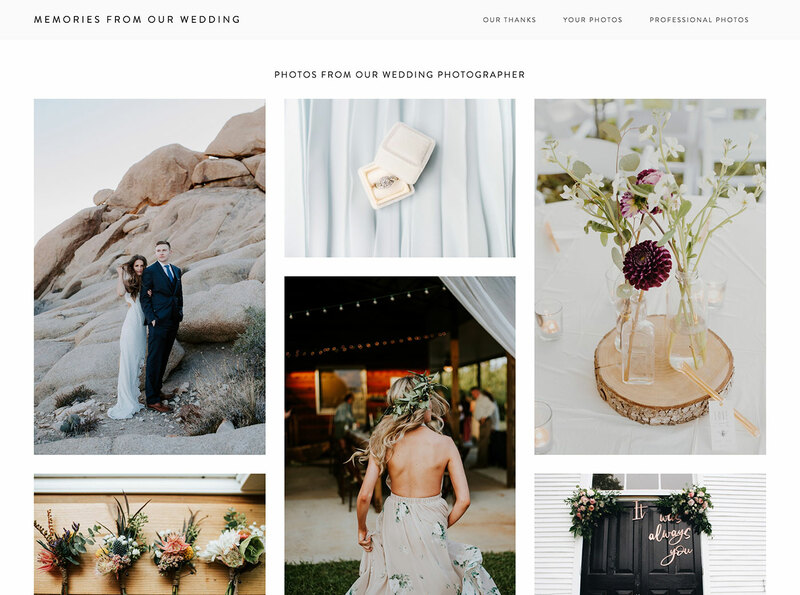 We created a sample website to show you what we’re talking about—transforming the wedding website experience from “here’s what to expect” to “here’s what happened”—scroll on for all the details! This is the Sonny template, if you’re looking for a good place to start. If you’re scared of commitment (you did just say the biggest yes of your life, after all) don’t worry—you don’t have to pay anything for 14 days! Even then, we’ve got a code for you: 10% off your first purchase with the code “GWS18”! Move your RSVP, registry, maps + details, and any other pages centered around planning down to the unlinked section. This way you don’t have to delete them, but visitors won’t be able to see them. Add a photo from your wedding day and a note of thanks. Create 2 new pages (“Your Photos” and “Professional Photos”) and link them to the toolbar. Squarespace has a truly amazing feature that allows you to display an Instagram photo stream from a hashtag search! i.e., WEDDING hashtags! Create a page to showcase your crowdsourced photos from the day and relive the day through your guests eyes. Everyone is always DYING to see the official wedding photos when they’re released—so why not do it in a format that makes them shine the most? Squarespace’s galleries are TOP notch. Honestly, they are why Squarespace is always our first choice for building a wedding website. Nowhere else do photos navigate SO easily and look this good. Plus, a page for your professional photos is a fun way for guests to grab + share photos, putting a perfect cap on your perfect day. If website design isn’t your thing, Squarespace makes it easy. Really. Just choose a template and watch those memories come to life. Happy ever after!